Ah, the sun, surf and sand. Whether vacationing on the Left Coast, scuba diving in the clear waters of the South Pacific or sipping rum punches on the beaches of Mexico, this time of year is mostly about getting as out-of-shape as possible. Sounds good; no? Until this summer, I usually could be found at music festivals—leading orchestras, teaching or diving into opera. But, after fifty years of doing exactly that, I decided that it was time for a break. Upon wrapping up my music director tenure in Detroit in June, which was to be followed by finishing the last week of the season in Lyon, I would take a few months off with no plan in place. Then there was the intervention of the Deus Cordit (just threw that in for all of you to look up). Thus, the vacation was extended by six weeks, as I spent eight days in the hospital and several more recuperating at homes. Yes, you read the plural correctly. With the instruction to diet and exercise came the caveat “but not too strenuously.” No heavy lifting. But we were moving to St. Louis, and there was no way that I could sit idly by while my precious collection of recordings, various awards and other memorabilia were crated up by strange hands. Clearly the packing part would have to be a matter of trust. Cindy is a master supervisor and juggled the Four Horsemen of the Relocation as they carefully loaded everything into boxes and onto the truck. The same could be said for my assistant Leslie, who had the unenviable task of putting all the scores, pictures and more memorabilia into order and onto the monstrous lorry. Everything had been coordinated to a T. With my son and his fiancée visiting for the farewell gala, getting our two cars to St. Louis would be a breeze. As a native Angelino, I never learned to drive a manual transmission. After all, why would I want to give my conducting arm any more stress than it already endured? But Bridget is a car enthusiast. She and Cindy would take the sports car south, and Daniel and I would drive the new auto to the Arch. We set off promptly at 10:00 in the morning on a Sunday, hopefully assuring us a traffic-free trip. I had put together a playlist of songs and, noting my son’s rather dismissive attitude toward The Fifth Dimension, Mungo Jerry and Juice Newton, I relished making him suffer for the next eight hours. About an hour and a half into the journey, we got a call from Cindy. 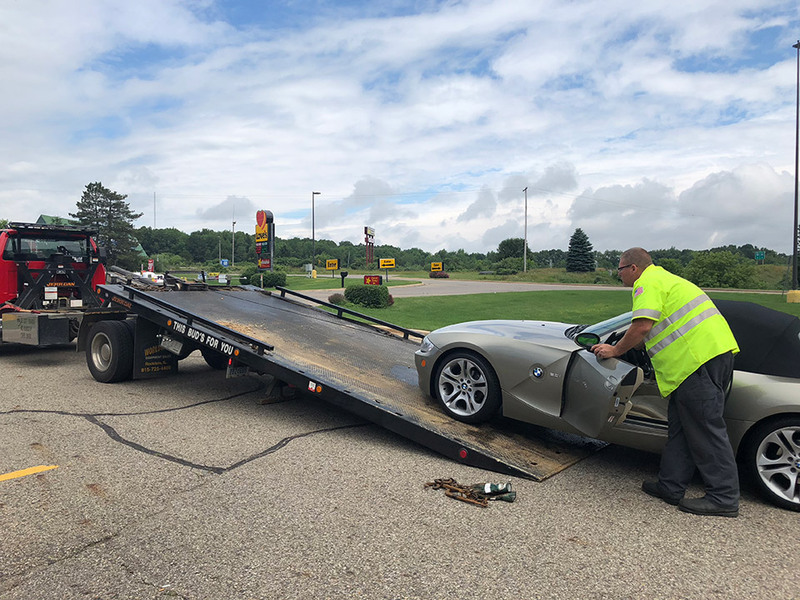 Their car had broken down outside of Kalamazoo. They were able to get to a rest stop and wanted Daniel and me to meet them to figure out what to do next. I don’t know much about the city, other than that I had received an honorary degree from Western Michigan University and that the phrase “from Timbuktu to Kalamazoo” seemed funny when I was a kid. Now it did not seem as amusing. Because it was Sunday, and drizzling, we held out very little hope that there was anything we could do that would expedite our continuing trip, but as luck would have it, a towing company came to take the little engine that couldn’t to the big city. There it would remain for a couple weeks while it underwent something akin to the surgery I had undergone a few weeks earlier. Somehow, we managed to get the contents of Cindy’s car combined with the already overstuffed crossover vehicle that I was driving. With luggage, beverages, rugs and the contents of a dry-goods store packed in, we continued our trek. Arriving around 7:00 in the evening, I got my first glimpse of the new digs. Some furniture had already made its way into the house, so we were not without places to sleep. In my head, I was mentally putting things into order, awaiting the arrival of the trucks the next morning. But I was still under instructions to do no weightlifting. What to do? That was when I truly realized why I had a son. It was not just to watch him turn into a fine young man, to shape his thought process or to help him through the travails of growing up. No, it was to be able to order him and his fiancée around, telling them where things went and to be careful not to drop anything. All that financial assistance I gave him was finally paying off. After a couple days, a great deal had been accomplished. There was still much to do, with many unopened containers, most likely household items that I had long forgotten about. The pleasure of discovery would occupy me for the next few weeks. But with that came the realization that the ban on my membership in the Teamsters Union had expired, and I would have to exert some energy to put items on shelves, sort out the CDs, LPs and videos, and actually help out. After about six weeks, Cindy and I feel very settled into our new climes. We love the city and community. There are a couple great markets that make my culinary exploits very interesting. The barbeque has been firing up non-stop, other than the occasional interruption from thunderstorms. The transition of medical teams has been successful, with the St. Louis group unfortunately agreeing with the docs in Ann Arbor that I must maintain a regimen of healthy eating and continued muscle work. I do not wish to hear the word “core” ever again. There have been a couple of dietary restrictions that are difficult to resist in St. Louis. First and foremost is eliminating the weekly visit to Ted Drewes, the preeminent frozen custard stand in the world. (I cheated once but now they have a portion size called “micro.”) And then there is the local thin-crust pizza and toasted ravioli. The baseball team is not faring as well as I thought it would upon my return, but in any case, I can no longer consume the Ultimate Stadium Nacho Tater Tots. It has been a good time to revisit and catch up on movies and television that I have missed. Because of the luxury of so much time off, I could go back and peruse an entire series leading up to the new releases, which I would then view in the theater. The five Mission Impossible films set me on the way to the latest installment (loved it). The two incarnations of the Jurassic universe gave me context for the new one (not so interesting for me). At home it was completing the journey through Homeland (excellent), The Handmaid’s Tale (terrific until the end that sets up next season) and The Americans (very compelling). I listened to a lot of jazz from the ’60s (Don Ellis, Oscar Peterson and Shorty Rodgers). And yes, I stayed away from classical music. What is that? You want to know if I am doing any work at all? Yes, but that will be part of the next entry here.